There was a prototype of thin display few years back which a lot of people boldly expected to replace the contemporary paper newspapers and so. It was just prototype then but now, it has become reality. Sony has just debuted 2.5- inch full-color bendable display. It is just as thicker as normal paper i.e less than 0.01 inch. 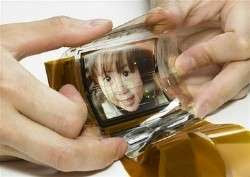 This innovative Sony's paper-thin color display currently is produced by Japanese company. The best use of it is, it can be worn like clothings, thereby integrating motion rich signs and advertisements. Since it's bendable, the company claims it's almost unbreakable and since it's also so slim, now, it's cent percent sure that mobile gadgets will even get lighter and slimmer using this kind of display technology which is neither LCD,TFT nor plasma. aunchaa hola ni 1-2 barsa bhitra ta ?????? ?